Difference between revisions of "WinNc"
WinNc is a file manager for Windows 7 /Vista/XP/2003/2000/ME/98/95 that replaces the use of the existing Windows Explorer. Developed by a Dutch multimedia company called Dunes MultiMedia, WinNc uses the same key shortcuts and the same mouse functionality as a well-known DOS file manager, Norton Commander. The product gives you direct drag-and-drop access to servers, network neighborhoods and other network computers in the double-pane interface, each of which function independently. In addition to standard file-management functions such as formatting, copying, moving, deleting and editing files, WinNc lets you view inside compressed files as if they were directories (it allows you to split, encrypt and FTP files, too). 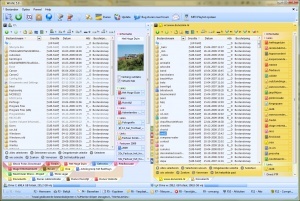 WinNc can view JPEG, GIF, BMP, TGA, WMF, PCX, WAV, FLC, DOCS, XLS, HTML, MID and AVI files. It supports extraction from WAV to MP3 files, ripping audio cd's to MP3 and converting WAV to MP3. A new feature in WinNc is the ability to record files on CDs or DVDs. WinNc is shareware and can be freely downloaded and distributed from the Dunes MultiMedia website. A related software, a graphical shell for DOS and Windows, Norton Desktop, was produced as a successor. It came in two variants, Norton Desktop for DOS (NDD) and Norton Desktop for Windows (NDW).